Exploring Texas is one of my favorite pastimes since living in Texas. Before moving here, I thought it would be all about the Alamo, cowboy boots and 10 gallon hats. Boy was I wrong! There is so much to discover in this beautiful state. I’ve been to several towns and have been delightfully surprised by the diverse terrain, people and culture. 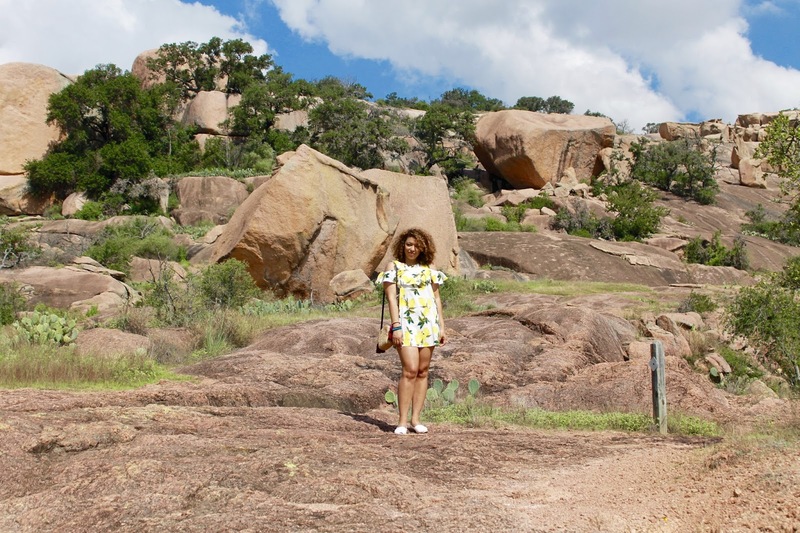 For this little road trip, we visited Enchanted Rock State Natural Park. Located near Fredericksburg, TX, only 1 hour 30 minutes away from San Antonio. The road to Enchanted Rock is quite beautiful. You notice the change of scenery when you start driving through the rolling hills and beautiful foliage surrounding the road itself. Upon approaching the park, you see these domes of pink granite that are pretty massive. Legend has it, the rock formations have mystical powers. I wasn’t so sure about that, but I certainly felt more connected to the Earth during my visit! It’s still pretty warm here in Texas, but that didn’t stop us from getting a quick shoot in. I wore a lemon print, cold shoulder dress that’s perfect for this weather paired with my favorite shoes of the Summer from Vestigio LIFE. This shoe brand is so amazing, locally based out of San Antonio, Colombian born designs and sources her shoes from her home country. Check out the full story for this awesome brand on Style Lush TV! Explorar por Texas se ha convertido en uno de mis pasatiempos favoritos desde que vivo aquí. Antes de mudarme, tenía la percepción de que era todo sobre el Alamo, botas y sombreros de vaqueros. Cómo me había equivocado! He podido ver varios pueblos de este hermos estado y me he llevado la sorpresa grata de ver terrenos, personas y culturas diversas. Para este viajecito, fui al Enchanted Rock State Natural Park, cerca de Fredericksburg,TX, a sólo una hora y media de San Antonio. El camino a Enchanted Rock estuvo hermoso. Te empiezas a fijar en el cambio de paisaje cuando vas guiando por las colinas y el hermoso follaje rodea la carretera. Al llegar al parque, se ven unas formaciones enorme como cúpulas en granito rosado. La leyenda dice que estas formaciones contienen un poder místico. Yo no sé mucho sobre eso, pero definitivamente, sentí una connección con la Tierra durante mi visita! Aún el clima está bastante caliente en Texas, pero eso no nos detuvo y tuvimos una sesión de fotos. 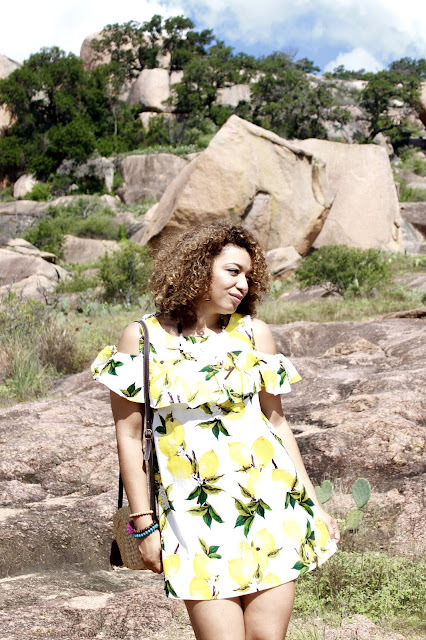 Yo llevaba puesto un trajecito con estampado de limones que esta perfecto para este calor, y mis zapatos favoritos del verano de Vestigio LIFE. Esta línea de zapatos es manufacturada en Colombia y la compañía está basada en San Antonio, TX. Lean la historia completa sobre ellos en Style Lush TV! Enter for chance to win a pair of Vestigio LIFE shoes! Oh girl I need these! These are so cute thank you! These look super comfy and cute! We did Enchanted Rock last year. So much fun! 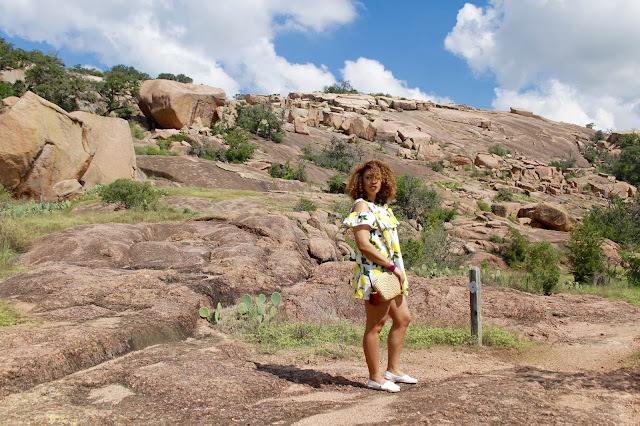 I have been wanting to visit Enchanted Rock forever! I need to go this fall for sure! fun photo location! such a darling outfit! Love that fun dress! Such pretty scenery. This is my all time favorite summer dress. SO cute!! I've never been to Texas and I am so intrigued. The scenery seems so different from Chicago! Your dress is so cute! I love the lemon prints! You look beautiful, as always, girlie! I love everything about this look, especially the bag and shoes! Thanks so much for sharing and I hope you have a great weekend ahead! hi , hope this is open worldwide , thanks for the chance ! I love that bag!! Such a stunning look! Such cute shoes and love the concept! yes! I love , these are perfect!! These are super cute shoes! Enchanted Rock is on my to do list. Maybe this fall!